Do you want to learn or improve your Welsh, but not sure where to start? Do you want to learn or improve your Welsh, but not sure where to start? Is your setting trying to implement more Welsh, but finding it difficult? You need the help of the Gwiriwr – the Online Welsh Language Level Checker. By answering just a few questions, this online tool will give you a ‘level’ of Welsh competency. Once you have this ‘level’, you can access FREE training that is best suited to you. To sign up, request your setting’s log-in code by contacting EDI@meithrin.cymruor by contacting your local Clybiau Plant Cymru Kids’ Clubs office and ask for the Welsh Language Officer. 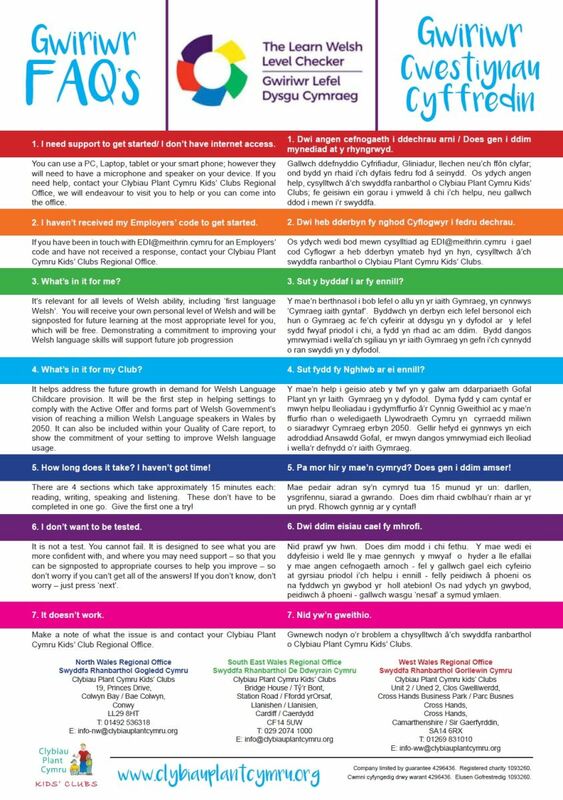 We’ve come up with a handy Frequently Asked Questions sheet to help you get off the mark. We hope you find it helpful. Go on, give it a go! What’s the worst that can happen…? !